New sight and smell variables added to define dinosaur species. Two new values have been added to describe a dinosaur species: Angle of Vision and Olfactory Acuity. Screen capture (click to enlarge). Note: the T. rex Angle of Vision has been increased to 55 degrees per, “Binocular Vision in the Theropod Dinosaurs by Kent Stevens”. 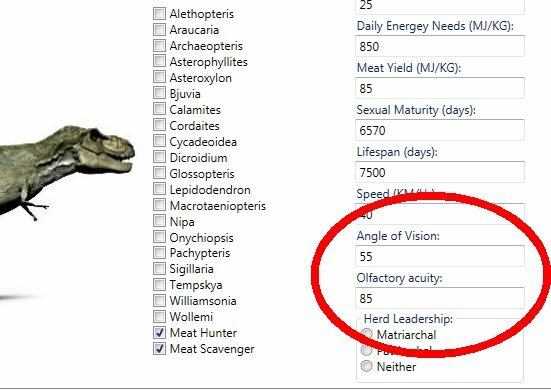 We’ve added two new variables to describe a dinosaur species: Angle of Vision and Olfactory Acuity. The Angle of Vision describes the width of the field of vision for a dinosaur. The greater the number the greater ‘peripheral vision’ the dinosaur has. Olfactory Acuity represents the dinosaur’s ‘sense of smell’. We know that some dinosaurs had large olfactory bulbs from casts of their brain cases. It is widely understood that predators, like T. rex had stereoscopic vision, like humans but their field of vision was limited to about 20 degrees while prey animals, like Edmontosaurus had eyes set far apart on their heads which allowed for very wide fields of vision. 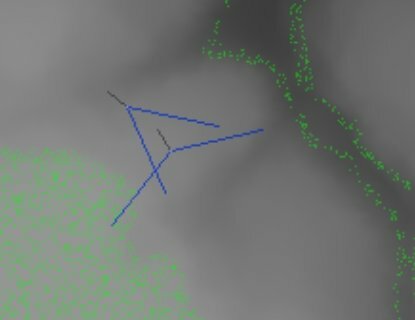 In this screen capture from the Dinosaur Island AI testbed program you can see a T. rex with narrow, 20 degree field of vision (shown by the blue lines) and two Edmontosaurus with much greater (120 degree) field of vision. Click to enlarge. In the above screen capture you can see the difference in predator and prey fields of vision. This will have an important impact on the AI that governs prey stalking and herbivore defensive strategies. In our previous post (Calculating the ‘cone of stink’ for a T. rex) we demonstrated how a T. rex would have to maneuver downwind of its prey before beginning it’s final rush towards its victim. A herd of Edmontosaurus, however, had numbers on their side. More eyes scanning the terrain might well give advance notice of an impending predator attack. In the next few weeks we will see the AI for both these attack and defense strategies implemented. Following a comment from Paleontologist Dr. Jordan Mallon (below) with a link to the paper, “Binocular Vision in Theropod Dinosaurs” Stevens, Kent, Journal of Vertebrate Paleontology 26(2): 321-330 June 2006, we’ve modified the field of vision for the T. rex to 55 degrees and the Edmontosaurus to 145 degrees (see screen capture below). 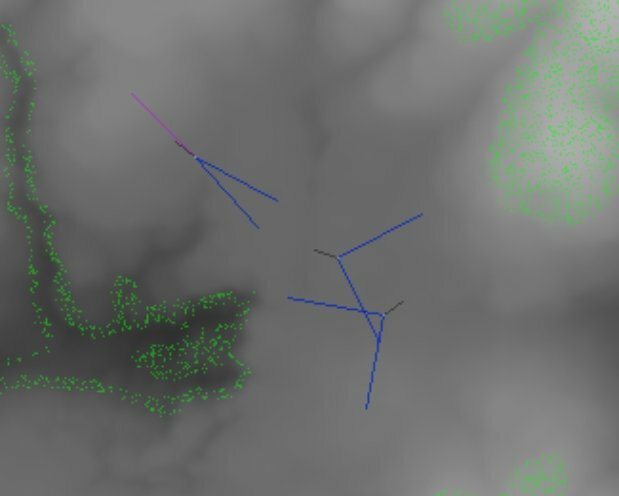 Screen capture from the Dinosaur Island AI Testbed program showing a T. rex with a 55 degree field of vision stalking an Edmontosaurus with a 145 degree field of vision. Specific information about the field of vision for hadrosaurs (like Edmontosaurus) does not appear to be available however, quotes such as, “The eyes were placed on the sides of the head which suggests that hadrosaurs were probably specialized for wide-field rather than for binocular vision,” definitely suggest a very wide field of vision. Dinosaur Island is specifically designed to easily change values such as field of vision for a species. 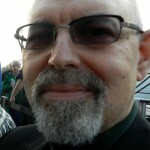 This entry was posted in Artificial Intelligence and tagged AI, Artificial Intelligence, Field of Vision, predator, prey, vision by Ezra. Bookmark the permalink. The paper suggests that T. rex actually had a field of view closer to 55 degrees. Unfortunately, I don’t think the same info is available for prey species. Thanks for the link to the paper! Much appreciated, in fact I was thinking of sending you an email before I started pumping values into the model to see if you knew of any research on the subject. It seems to me that Edmontosaurus – with its eyes set far apart on either side of its head – must have had considerably larger field of vision (80 degrees? 90 degrees? maybe even much more). Having done many models I learned a long time ago to make it very easy to change these values and I have already updated T. rex in the database to a 55 degree field of vision. An ungulate’s field of vision can range up to 280 degrees, so you might be underestimating the values for your edmontosaur, too. It’s too bad this type of work hasn’t been done for non-theropods. That’s very interesting. I will increase the Edmontosaurus’ field of vision even more. Again, this is why I design my modeling software to facilitate changing the variables and playing ‘what if’. Before you mentioned that prey dinosaurs might have a field of vision of 280 I was already formulating a defensive strategy that called for herd members to face in different directions while eating so that their fields of vision would overlap and that they would be able to see in all directions. This still might be a good behavior. That’s a neat idea, Ezra. I wonder whether the individuals in the herd would know where all the others are facing, though. What about an option to have them face randomly? I’m sensing that predators attacked when either they were certain of victory or they were driven by hunger. To be certain of victory they would have approached downwind and unobserved and then rushed towards the prey at the end. On the defensive side, I assume herds placed larger ‘bulls’ on the perimeter and they scanned the horizon more than just grazed continuously. The large percentage of T. rex’s with broken bones indicates, to me, that attacking prey was anything but a certainty. I’ve read Ruxton’s paper on T. rex and it heavily influenced the ability for the user to ‘toggle on or off’ T. rex being a hunter, scavenger or both. Also, see: http://dinosaur-island.com/2013/06/27/whats-for-dinner/. Again, thanks for the references. Reading the Carbone, Tuvey & Bielby paper now.